I was dreading riding to work in subfreezing temperatures this morning. Truth be told it wasn’t bad at all. I still hate having to put on and take off all the additional clothing though. It will be cold for one more week then we go back to seasonal temperatures and constant rain. Sitting in a ball park watching an exhibition game in late March may not be the brightest idea I ever had. This blog gives me daily reader counts by country. I know (at least) nine people who are overseas right now. Six of them (India, Australia, South Africa) are reading regularly based on blog diagnostics. Hi Rick and Laurie, Alan and Dona, and Joe and Jane. I left home a little late to avoid having to use lights. I got a sunrise picture as a bonus. I was going to go to my eye doctor appointment in Old Town tomorrow. He rescheduled it because of an expected snow storm. He’s a bike commuter. Probably doesn’t have fenders on his bike. The farther one bikes, the less one knows. Whereever you bike, there you are. I bike. Therefore, I am. To bike or not to bike? That is the question, albeit a stupid one. Some kind of happiness is ridden out in miles. I rode home in daylight. Saw a bald eagle perched above the Tulane nest. My face was moistened by hundreds of conversational snowflakes. My favorite blog is going into hiatus. Have a blast in Ireland, Britt. We expect a full report without any blarney. 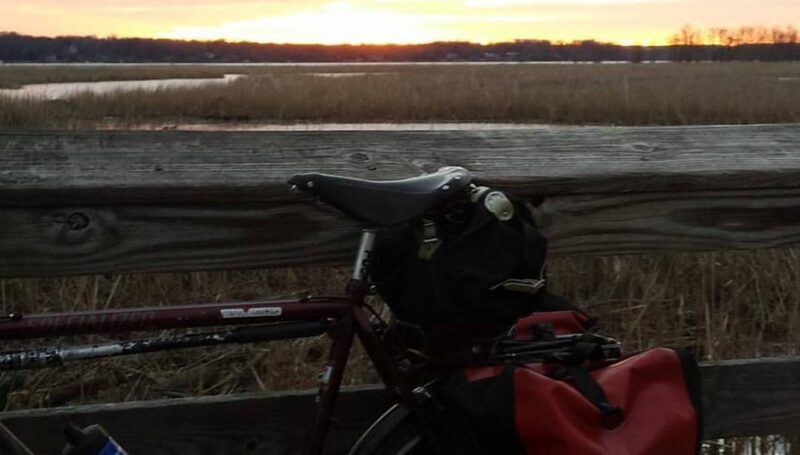 Posted on March 13, 2017 by rootchopperPosted in #bikedc, sunriseTagged #bikedc, #bikemvt, Bike Friday, MVT, sunrise, winter.